Emergency radios are very dynamic pieces of communications equipment and can be operated by way of numerous power sources. Let’s face it, no matter how effective your radios is, or how accustomed you are to its features, you can’t rely on it without power. Therefore, always opt for a radio with sufficient, even numerous power source capabilities. Let’s delve into a brief explanation of three of the most common emergency radio power sources. This is an ideal option if you travel in areas with limited or unreliable electrical supplies. If you have exhausted the radio’s battery power, then a hand-crank will get you up and running in no time. 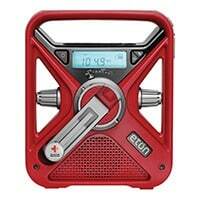 A hand crank radio is manually operated, with no need for any external electrical backing whatsoever. Just turn the crank and Bob’s your uncle. Most radios are conveniently equipped with this feature, so double check yours. The sun is a limitless source of power and energy, which means that a solar-powered emergency radio always has a power supply. Obviously if it is a cloudy day you may have to wait for some sunshine, but it’s an excellent choice to opt for. Jointly, if you are injured and not able to use a hand crank, the sun will prove vital in recharging your radio so that you can call for help. You never know what condition you may be in, but you do know that the sun will always be around, so keep that in mind. The AC adapter offers an external source of power. Emergency radios have an array of optional accessories and equipment that can be obtained. These components need to be constantly powered up as well, hence the advantage of an AC adapter. When plugged in, the adapter is able to power up both the battery, and other additional equipment. All in all, an AC adapter makes an efficient, multipurpose option for power supply. Luckily for emergency radio users, there are these power source options available, so that in any situation you will be powered up and secure. Ideally, it is best to get hold of an emergency radio that offers numerous power supply alternatives, as you never know if there will be no sun, if you will be badly wounded or if you will need to power up a whole bunch of extra equipment. Either way, now that you know about the most customary power sources, you can make up your mind accordingly. Stay safe out there! What is Specific Area Message Encoding (SAME)?